The current fashion style of India is rooted in ancient traditions. It is a fact, but it is not the whole truth. When you take a look at the history of Indian clothes, you see that some significant changes have occurred. For example, a century or so back Indian garments did not require any stitching. The people were cognizant of sewing, but their clothes did not need any. For them, a cloth was ready to wear the minute the loom finished it. Out of these four, three are yet commonly visible in the nation. The saree and uttariya were garments for women. The former is still worn by females all over the country, but the latter has fallen out of practice. The uttariya was a scarf or shawl like fabric that was worn to cover the top half of the body by draping it over the neck and under the arms. The dhoti is an attire meant for men. Today, it is mostly worn for festivals and holy ceremonies. It requires no stitching and generally worn by draping around both legs or passing a strip of it between the two legs and tucking it behind. The reason for such loose clothing was the hot climate of the country. The free-flowing fabrics allowed movement of air. The question is with such basic garments, how did people add a touch of bling or beauty. The answer lies with accessories. Women of India wore a lot of jewellery with their attires. From nose rings that symbolised a married woman to necklaces, there was no part of the body left bare. The hands were covered with bangles made of precious metals or glass; the neck generally had a plain necklace for young girls and a mangalsutra for married women. The feet were adorned with toe rings and anklets. This tradition of wearing accessories has remained. 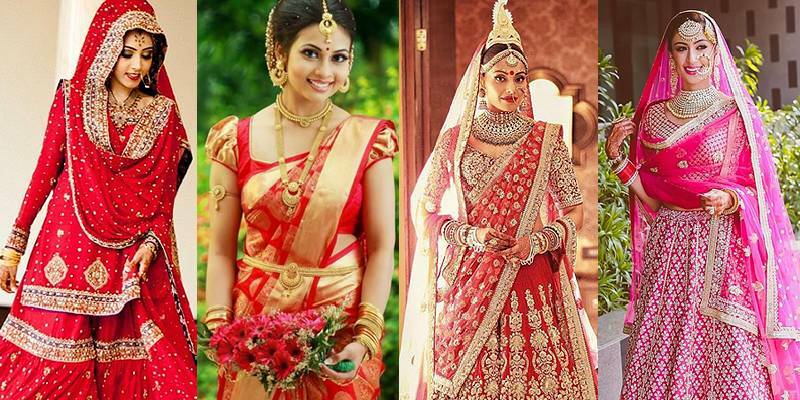 Women in India love to drape their attires with jewellery even today. This holds especially true when they wear traditional outfits like a saree, lehenga or salwar-kurta. The only difference that has occurred over the years is that even single girls have started opting for nose pins and toe rings. These were jewellery that was primarily meant for married women. The present fashions sense of Indian people can trace its routes to the ancient civilizations of Harappa and Mohenjo-Daro. With every ruler and culture that has been a part of our history, an impact was made on how people dressed. Some of that effect is visible even today. A perfect example is the re-emergence of the Anarkali. A style of salwar kurta, it was prevalent in the Mughal era. Today, we see it on the streets again. In this short piece, we leaf back the book of fashion and see how the saree and the salwar-kameez have changed. The hope is by reflecting on the changes in fashion; we can discern the transformation that has occurred in personalities too. Even the length of the blouse has decreased because it offers a more contemporary look to the wearer. The method of draping the saree is still the same because it provides the most comfortable wear. When we take a look at salwar-kameez, the change is even more drastic. It first began as switching out the salwar or chudidar with jeans or pants. The combination of a kurta and jeans created a unique Indo-western outfit that was not just smart but easy on the skin. Next came the variations in the kurta style. They were cut short to make kurtis. They were tightened to stick to the skin. They were given asymmetrical cuts to offer an unusual look. The modern version of the kurta can take any form and be worn with anything. It is not just the styling of saree and salwar-kurta that has altered. The fabric used to make them, the patterns in it and the work done on them has also evolved. Tellingly, both have become an extension of the values, beliefs, and thoughts of the current generation woman. They are what the modern female wants them to be and not just clothes handed down to them over generations.